FIFA will pay Seamus Coleman's Everton wages while he recovers from his double leg break. The governing body's Club Protection Programme enables teams to claim up to £112,731 (€143,836) per week of a player's wages if he is injured while on international duty. 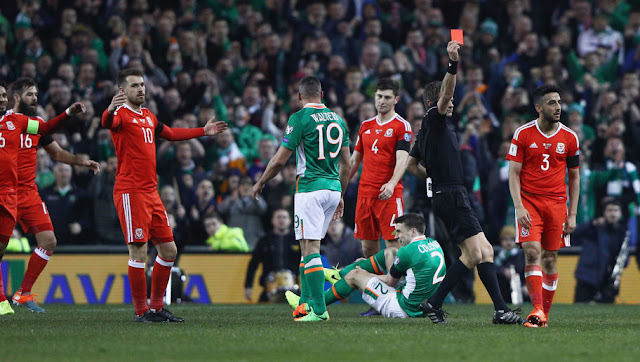 Coleman is understood to earn around £45,000 a week at the Toffees and could be out for as long as a year after fracturing both the tibia and fibula bones in his lower-right leg. Coleman underwent successful surgery in Dublin on Saturday following a challenge from Wales' left-back Neil Taylor, who was shown a straight red card for the challenge, during the Republic of Ireland's 0-0 draw against Wales in World Cup qualifying. FIFA's Club Protection Programme was set up in 2012 after mounting pressure from clubs trying to claim compensation for players being injured on international duty. Club's pay an excess fee equivalent to the value of four weeks' wages and can then be covered for the duration of a player's absence, up to the value of £100m. That value, however, covers all players injured on international duty over the course of the international calendar year.